COVER BY GREG LAND THE FINAL SHOWDOWN FOR…A MAN CALLED X! • It’s XAVIER and PSYLOCKE versus PROTEUS! 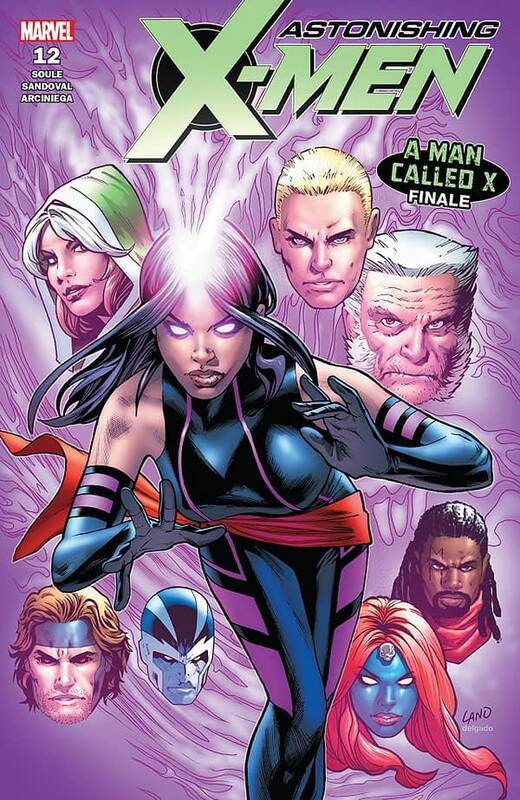 • And when the dust settles, what’s next for the Astonishing X-men? 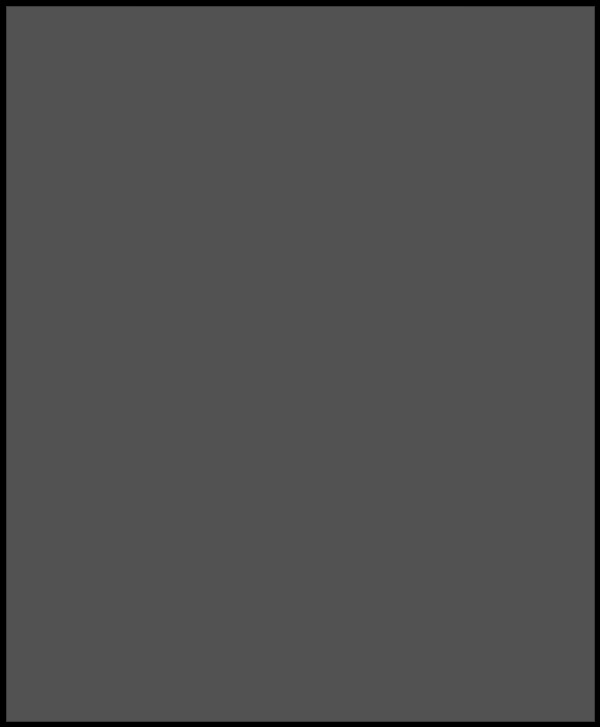 It’s the final issue before a new creative team and a new cast takes over this book, which means we’ll hopefully be seeing most of the plot threads wrapped up here. Last issue, The Shadow King exploded out of the head of X, the reincarnated Professor Xavier, and he opens this issue by inflicting psychic despair upon the X-Men, taking most of them out of action and making Old Man Logan stab himself in the chest with his own claws. Well, that’s one way to clear the room for the original Wolverine’s return. Psylocke is the only X-person left standing to take on the Shadow King. Though he was exploded last issue, X is narrating this issue. He notes that psychic nodes are popping up all over the world, creating a web of the Shadow King’s bad influence. As the other X-Men are lost in their own minds, Psylocke battles the Shadow King. Bishop lays on the ground using his technology to observe the world falling apart. Gambit plays cards. Rogue and Mystique are feeling so bad, they decide to have Rogue absorb Mystique’s personality. Archangel flies through the sky muttering “fallen angel” to himself. All in all, it’s pretty shallow, as far as these sorts of things go. 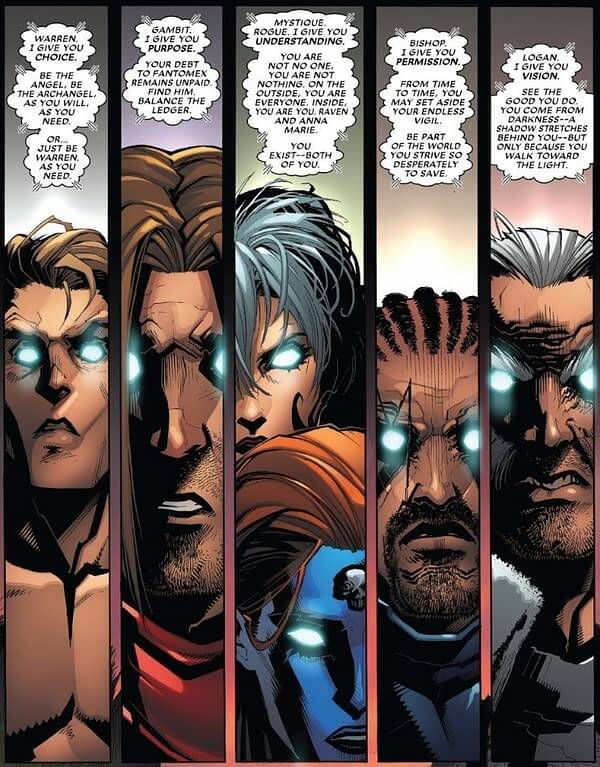 As X observes all of this, he realizes giving up isn’t what being an X-Man is all about. He pieces himself back together and stands up. With a new hairdo. We believe the phrase he’s looking for is “I don’t shut up, I grow up, and when I look at you I throw up.” But whatevs. X attacks the Shadow King and tells Psylocke to go save the world. But before that, he shows Psylocke how to ask all of the psychics in the world to contribute their power. He gives that power to Psylocke, who uses it to save the world and eliminate the Shadow King’s psychic nodes. Meanwhile, X grows large and stomps on the Shadow King. And the scarecrow gets a brain, and the tin man gets a heart, and the cowardly lion gets some balls… Also, X makes everyone forget everything that’s happened and forget he’s returned. Except for Psylocke, who he lets remember, mostly so she can take care of him if the Shadow King comes back. 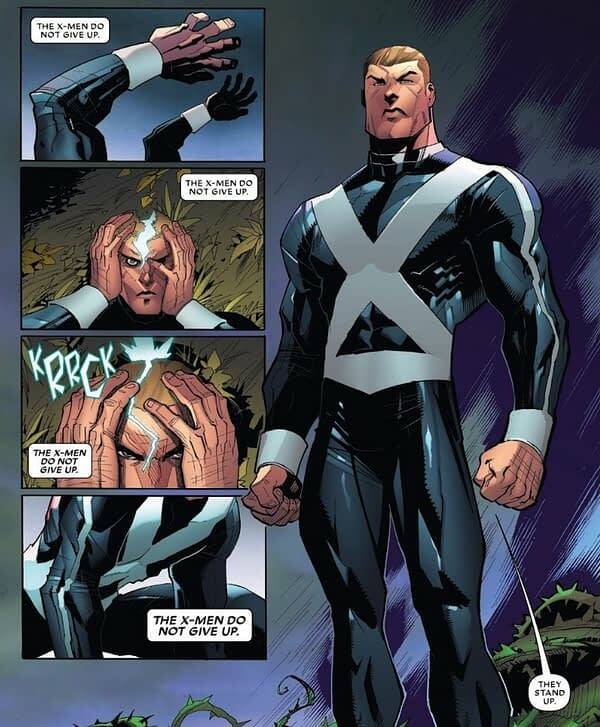 Psylocke asks X if he’ll be returning to the school, but he says he’s no longer Xavier, he’s X, and he has a new dream. That’s it? Seriously? Honestly, the ending was somewhat anticlimactic (and short) and X as a character is not that interesting and definitely not as interesting as Professor X was. Boy, does Charles Soule love killing and bringing back Wolverines though. This was a twelve issue run, but modern decompression techniques (only two “stories” happened) make it feel like it was over in a flash. It took us a year to read this 12-issue story, but what happened in it covered the span of about a week. If Marvel wants to make trade paperbacks, just make trade paperbacks then. Otherwise, treat the monthly format as the primary one. That said, we’re looking forward to the not-a-reboot next month. Might as well go read the Outback X-Men in anticipation of next issue’s not-a-reboot. You can find it starting at Uncanny X-Men #229 on Marvel Unlimited.